Bandungjobfair.com - Lowongan Kerja Bandung Terbaru di EVERYDAY SPA NARIPAN Desember 2017. Balinese massage technique is our main focus of our treatments. The main reason behind this, is that balinese massage has been well known in the world as one of the most famous for its relaxation effect. We also only employ talented balinese, and other highly selected therapists, well train them, to be fitted with the character and the soul of our treatments. In Everyday, we only use the finest natural ingredients for your body. Even with affordable price, our customer will enjoy our best relaxation technique, material, and our warm hospitality. These are the reason why EVERYDAY has become the most favourite choice of thousands of people for their relaxation. Everyday has grown so fast and well known for its uniqueness in the industry. All of these achievements also come from highly motivated management teams that always focus on its mission and vision to be the best in the relaxing you. 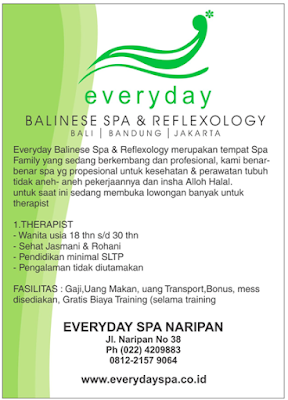 Demikian Lowongan Kerja Bandung Terbaru di EVERYDAY SPA NARIPAN Desember 2017 semoga bermanfaat.